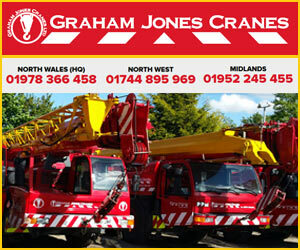 Graham Jones Crane Hire is known for its fast and personalised service and this policy has continued with the rapid expansion of the company. Every successful lift has our team of specialists on hand, working exclusively with clients to plan heavy or difficult lifts and recommending the best and most economical solution to the job. Our wide experience and expertise have also allowed us to build an enviable reputation in the field of contract services. We offer one of the foremost lifting and movement services in the North West and are able to combine the right equipment, planning and manpower to solve problems whether large or small. Our comprehensive range of equipment offers a complete package deal of craneage, transport riggers and ancillary lifting equipment. We will speedily and efficiently undertake work ranging from handling and erecting large vessels or modules on site, the movement of a large private boat or the relocation of portable cabins and general site equipment. Work can be undertaken at short notice, as well as long term projects. In every case we provide the highest standards of efficiency and reliability. In the absence of an appointed person within the organisation to carry out all the necessary planning, it is necessary for the crane operation to be supplied as a comprehensive package so that you can ensure you are meeting the standards required to comply with LOLER. We will provide you with appropriate site survey, documentation and supervision for the lift as well as the correct support team and any necessary ancillary services. As members of the CPA, we use their standard terms and conditions for contract lifting (please see the PDF on our website) and are able to carry out a specific fully managed lift where we will plan and supervise the lifting operation, supplying all the necessary paperwork, personnel and expertise.